Electrical engineering Professor Robert Magnusson is manipulating light to help improve lives. He designs nanophotonic chips outfitted with arrays of devices. The example at right contains narrowband reflectors for laser applications. 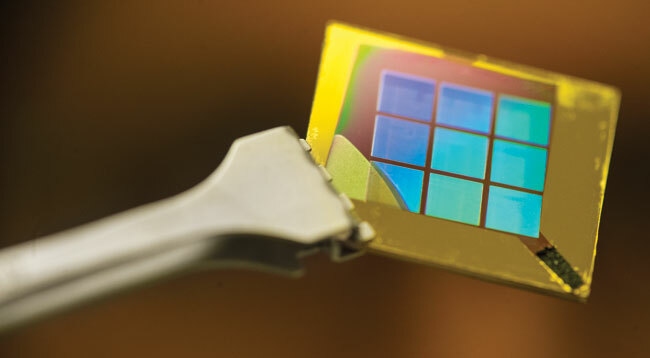 Operating at an infrared wavelength beyond the visible spectrum, the chip provides ultra-narrow resonant spectral lines that enable lasers to emit extremely pure, single-frequency light. Such stable narrowband lasers have applications that range from medical technology to fiber-optic telecommunications.